A familiar grin that is infectious. Curly long hair that made him stand out. Aerial control and immaculate dribbling skills that any player would be jealous of. Fascinating dance moves as celebrations. Representing clubs that budding footballers would dream of playing for. He had all this and so much more. 21 March 1980 - the date when the birth of a boy took place in a slum of Porto Alegre in Brazil. That boy who went on to become a magician of the beautiful game. Yes, I am talking about none other than Ronaldinho Gaúcho. A young Ronnie's career began at the local club Gremio in 1997. French giants Paris Saint-Germain came calling in 2001. The Brazilian then put pen to paper for Barcelona in 2003 and achieved the pinnacle of his career at Camp Nou. The forward's love affair with football continued and he represented the likes of AC Milan, Flamengo, Atlético Mineiro, Querétaro, and Fluminense after his departure from the Camp Nou. The wide-grinned Ronaldinho is extremely decorated as well - both at an individual and club level. The FIFA Confederations Cup (joint) top goalscorer with 9 goals, 2005 European Footballer of the Year, FIFA World Player of the Year (2004 and 2005), the Golden Foot in 2009 are some of the individual honours received by Ronnie apart from the Ballon d'Or in 2005. The skilful attacking midfielder also won two La Liga titles (2004-05 and 2005-06) as well as a UEFA Champions League title (2005-06) with Barcelona; the Serie A title (2010-11) with Milan; the Copa Libertadores (2013) with Atletico Mineiro; the FIFA World Cup (2002) and FIFA Confederations Cup (2005) with Brazil. Ronaldinho is the kind of player who could light up the entire stadium with his mere presence on the field. He is one of the few players who never had many haters. One particular match comes to mind. 19th November 2005 - the day the famed El Clasico was being played at the Santiago Bernabeu. It was a crucial encounter as just a point separated the two Spanish football giants Real Madrid and Barcelona. The Brazilian was 25 back then. He took apart the Los Blancos singlehandedly. Ronnie scored two spectacular solo goals on the evening which none of his fans will ever forget. Samuel Eto’o had already given Barca the lead before half time. It became a one-man show thereafter. Upon receiving the ball from Deco at the halfway line, Dinho flew past Sergio Ramos and cut inside Ivan Helguera to bury a powerful shot past the hapless Iker Casillas. Madrid's defence had no answer to the Maverick Ronaldinho as he made another blistering run a few minutes later and got his second of the night with an exquisite finish. The Madridistas could not help but get up on their feet to applaud the spectacle they were witnessing. They forgot entirely about the rivalry between the two clubs and were just left in awe during those magical moments. Just unbelievable scenes. Exactly nine days after this historic match, Ronaldinho won his only Ballon d'Or award. Watching him was like watching a master at work who is at the very pinnacle of his art. Ronnie left those watching him spellbound. Maybe that is the reason why he garnered so many fans around the World. There are innumerable more moments of brilliance produced by Ronaldinho - the free-kick goal against England during the 2002 World Cup, the shimmied toe punk against Chelsea during the Champions Leauge in 2005. The free kicks, the nutmegs, the no-look passes, the swift changes in pace, the step-overs, the backheels, the lobs, the passes with the back, the toe-pokes, the elasticos, the twisting and turning which left defenders baffled, some skills which can't be described - Ronaldinho's arsenal was just so diverse that it made him an ideal number 10. I consider myself to be lucky to have witnessed Ronaldinho play the beautiful sport during his prime. I pity those who can not watch the goofy-grinned genius work his magic anymore. He was not just any player ladies and gents, he was an emotion - a phenomenon - an entertainer - a talent born once in a lifetime - captivating - someone who did things no one else could - an epitome of Joga Bonito - a celebration of football. He was Ronaldinho. As they say, 'All good things come to an end.' After multiple years of entertainment, Ronnie bid adieu to the sport in 2018. 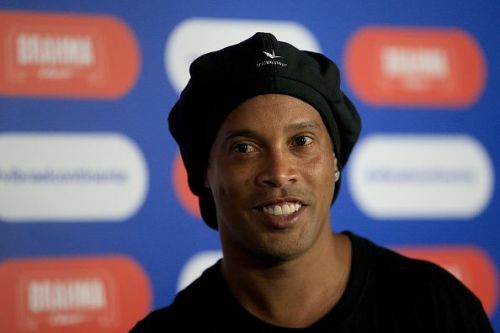 There was an inadvertent fall in Ronaldinho's career post-2006. He burned brightly - albeit only for a little while. Maybe that is the reason why he is not considered the greatest of all time. No matter what, I will always be a huge fan.